I'm Karen Cáceres; a writer, music composer & producer I offer: 1. Audio & Music Services (All Genres Of Music): a) Music Composition & Production (Original, Scores & Reinterpretations/Remix), Arrangements, Editing, Mixing, Mastering, Audio Restoring and Clean Up, Personalized Songs for Marriage B-Day Dedications, Sound Fx Creation & Design, Audio File Converting, Lyrics Writing in English (USA) and Spanish & Voice Over. b) Compositions Production and/or Sound Design; for Music Projects, Video-games, Apps, Videos, Jingles, Trailers/Spots, 3D Animations, Documentaries, Cartoons, and more. 2. Writing Services: I'm an creative writer who is always on time with professionalism in all the works that i do. I can work on Essays; Articles about Travels, Lifestyle, Music, Arts; Criticism of Songs, Videos, Artworks or an Artist; Songwriting; attractive descriptions for Blogs; Love Stories; among others. I'm serious, well organized, fast, respectful & determined. Press Staff & Writer at Zona de Rapper (Digital Hip Hop Magazine). My articles are about Criticism of Songs, Videos, Artworks or Artists; defragmenting the piece analyzed, under a musicological analysis; written in a language that the ordinary citizen can understand, but without losing the academic essence. Music Artist, Songwriter, Composer, Producer & Sound Engineer. 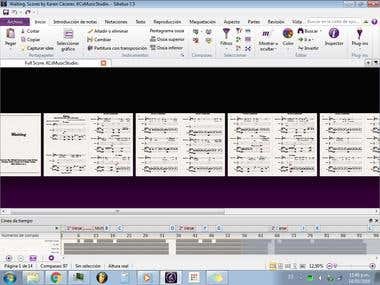 Music Production and Composition, Editing/Cuttings, Arrangements, Audio Restoring and Clean Up (Noise, Click, Distortions etc), Mixing, Mastering, Audio File Converting, MIDI compositions, Music Reinterpretations and Remakes, Fx Creation, Music Sheets, Lyrics Writing in English (USA) and Spanish, Voice Over pieces and Recordings, Sound Designing. Recording and Mixing Workshop. Dictated by Yein González (from Daniel E. & Yein G., Producers and 2010's Latin GRAMMY winners). Management systems for concerts, installation and calibration workshop. 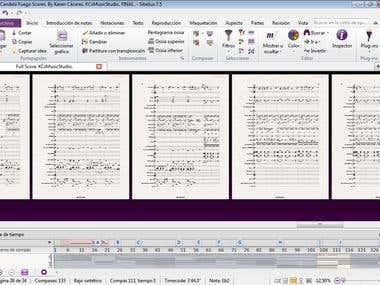 Dictated by Oscar Barrientos (Instructor in chief for Meyer Sound Mexico). Music Therapy Workshop. Dictated by Yadira Albornoz [Doctor of Philosophy in Music Therapy (PhD), Certified by the American Music Therapy Association and Master of Music Therapy & Music Composition Bachelor of Music at Temple University]. School of Actors and Actresses, "El Universo del Espectaculo". Actress with the ability of build, embody and interpret characters; in telenovelas, miniseries, series, theater, film, television movies, comedy shows, short films, theater plays and radionovelas. Professional Flute Player. Orchestra of San Antonio de Los Altos. Promotion: 2003-2008. At my 10 years old, i got a recognition from the Mayoralty, for my excellent performance as a member of the Orchestra of San Antonio de Los Altos. At the age of 9 years old, i got my 1° music diploma; this is, the diploma of the successful completion for one year studies about the Rhythmic in Pre-Children Orchestra. [DUBSTEP] "ENT11. La EmineMCa ft. Elys Rendon. Instrumental by Karen Cáceres. Prod. Karen Cáceres." "ENT11 [EntOnce`]". La Eminemca ft. Elys Rendon. Instrumental: Karen Cáceres. Prod. Karen Cáceres. KC's Studio (recording studio). Youtube Search: ENT11. La EmineMCa ft. Elys Rendon. Instrumental by Karen Cáceres. Prod. Karen Cáceres. [English] "Dej Loaf - TRY ME REMIX ft KAREN CÁCERES. Prod Karen Cáceres & Steven Faison." "Dej Loaf - Try Me (Remix) ft. Karen Cáceres." Remix By Karen Cáceres. Instrumental (edited by) Karen Cáceres. Prod. Karen Cáceres & Steven Faison. KC's Studio (recording studio). Youtube Search: Dej Loaf - TRY ME REMIX ft KAREN CÁCERES. Prod Karen Cáceres & Steven Faison. "Venezuela S.O.S. (Official Video). By Karen Cáceres. 2014." "Venezuela S.O.S. (Official Video)" By Karen Cáceres. Instrumental By: Karen Cáceres. Written by: Karen Cáceres. Prod. Karen Cáceres. KC's Studio (recording studio). Youtube Search: Venezuela S.O.S. (Official Video). By Karen Cáceres. 2014. "Momento Mágico. By Karen Cáceres. Prod. Karen Cáceres." "Momento Mágico" By Karen Cáceres. Written by: Karen Cáceres. Prod. Karen Cáceres. KC's Studio (recording studio). Youtube Search: Momento Mágico. By Karen Cáceres. Prod. Karen Cáceres. "Dale Batio. Crisler Spadachin, Alquimista & Lil Manic. Beat by Karen Cáceres." Dale Batio. (La Parte Baja Album). By Crisler Spadachin, Alquimista & Lil Manic Instrumental By: Karen Cáceres. Prod. Karen Cáceres. KC's Studio (recording studio). 2011 Youtube Search: "Dale Batio". Crisler Spadachin, Alquimista & Lil Manic. Beat by Karen Cáceres. [Spanish Article] "Apache, Original Combination. Part I"
[Spanish Article] "Apache, Original Combination. Part II"
[Spanish Article] "Mas Mía Que Tuya. Truko, El dueño de la musa". [Spanish Article] Realengos. "El Plan".